A beautifully detailed series combining a number of very detailed charms with the sparkling beauty of Swarovski crystals. 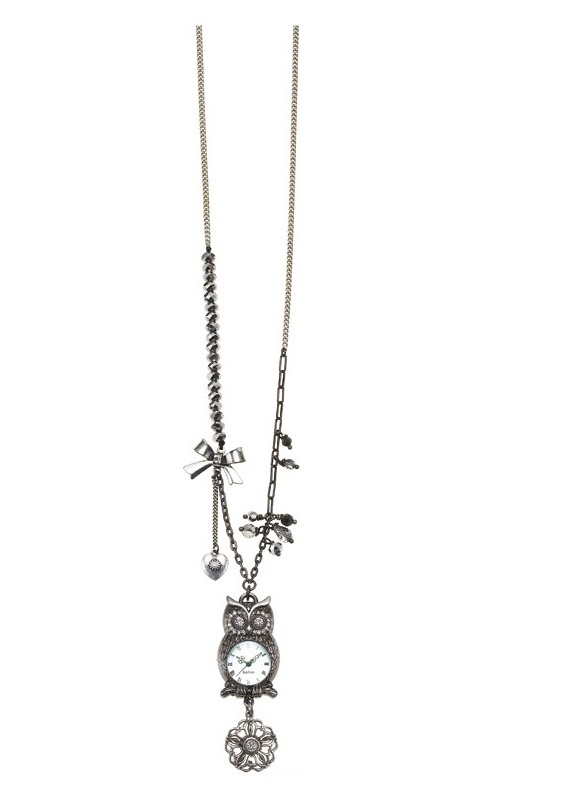 The necklaces feature the most amazing owl 'clock' that keeps very good time! Available in 2 colours: mixed gold/silver plate OR hematite plate. 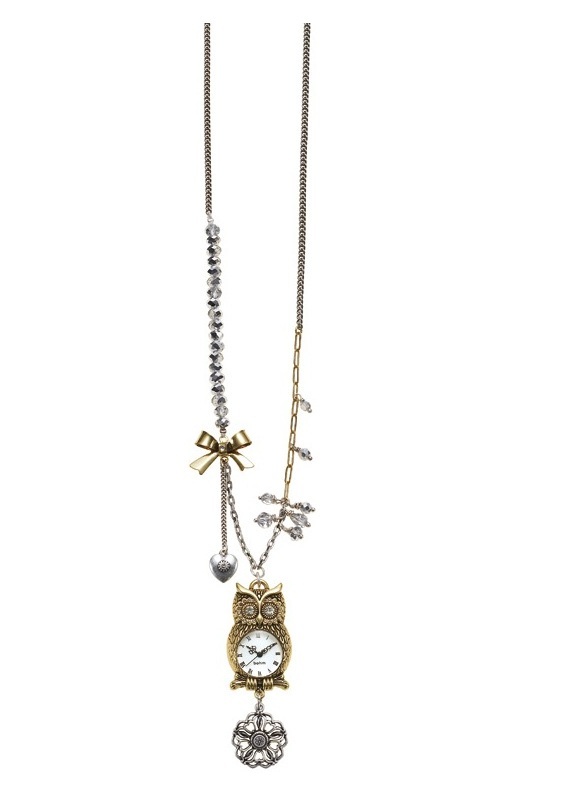 Stunning 'Charm Du Jour' longer length necklace by The Bohm. The chain, a neat flat curb (3mm) measures 28 inches/71cm to an adjustable 31 inches/79cm. The owl (a working clock) measures 4cm/40mm in length. The pendant measures 7.5cm/75mm in length. Mixed gold and silver plate. Studded with Swarovski crystals and Swarovski crystal beads in clear, clear AB and Topaz brown. Stunning 'Charm Du Jour' longer length necklace by The Bohm. It chain is a neat flat curb (approx. 3mm wide) and it measures 28 inches/71cm to an adjustable 31 inches/79cm. The owl (a working clock) measures 4cm/40mm in length. The pendant measures 7.5cm/75mm. Studded with Swarovski crystals and Swarovski crystal beads. In a dark grey 'Hematite' plate with clear and clear AB Swarovski. 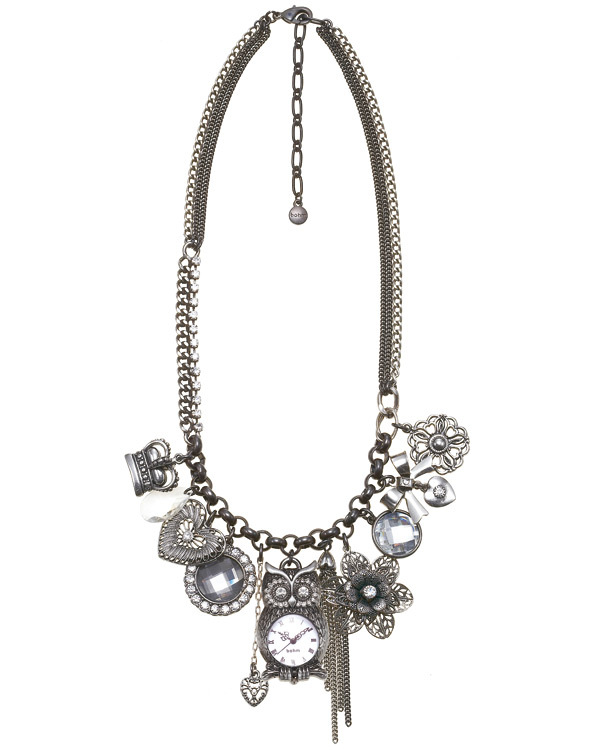 Charm adorned 'Charm Du Jour' necklace by The Bohm. The chain, multi-stranded with various chain styles. It measures 18 inches/46cm to an adjustable 21 inches/53cm. Various detailed charms include: Swarovski crystals and beads, various heart designs, crown, flowers, bow and an owl clock (this is fully functional). The owl is the largest charm at 4cm/40mm long. Hematite (dark grey tone) plate. Studded with Swarovski crystals and Swarovski crystal beads in clear and clear AB. 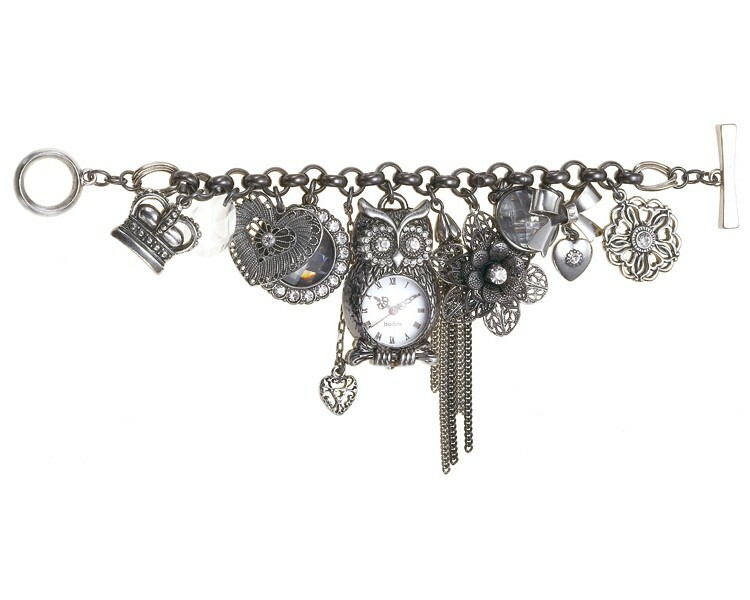 Charm adorned 'Charm Du Jour' bracelet by The Bohm. The chain, an o-link 3mm thick. It measures 7.5 inches/19cm and fastens with an 'o' toggle. Various detailed charms include: Swarovski crystals and beads, various heart designs, crown, flowers, bow and an owl clock (this is fully functional). The owl is the largest charm and measures 4cm/40mm length. Mixed gold and silver plate. Studded with Swarovski crystals and Swarovski crystal beads in clear, clear AB and Topaz brown. 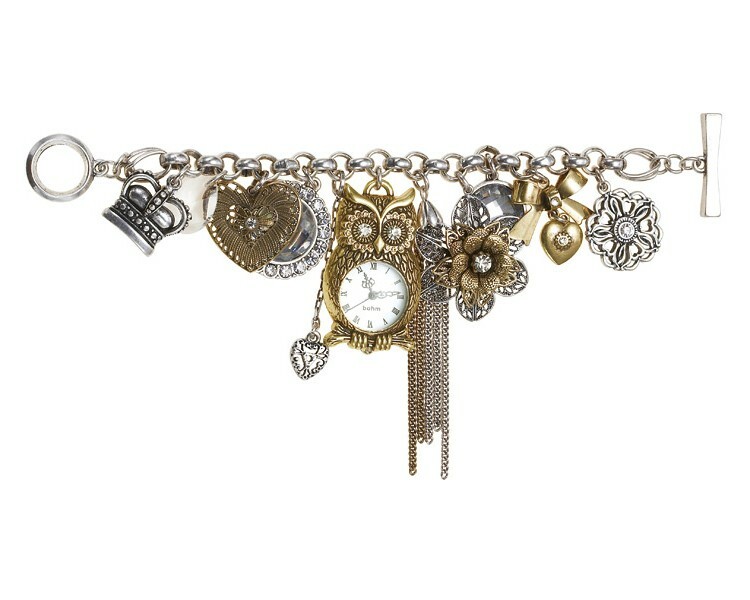 Charm adorned 'Charm Du Jour' bracelet by The Bohm. The chain, an o-link 3mm thick. It measures 7.5 inches/19cm and fastens with an 'o' toggle. 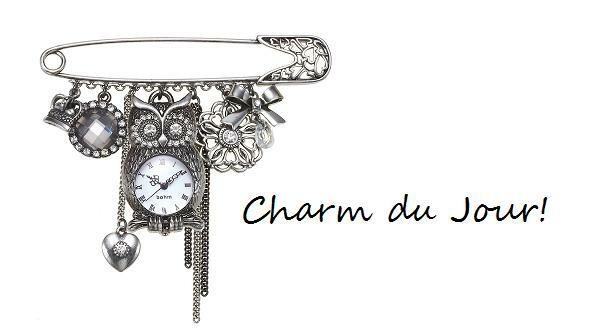 Various detailed charms include: Swarovski crystals and beads, various heart designs, crown, flowers, bow and an owl clock (this is fully functional). The owl is the largest charm and measures 4cm/40mm length. Hematite plate which has a dark grey tone. Studded with Swarovski crystals and Swarovski crystal beads in clear, clear AB. 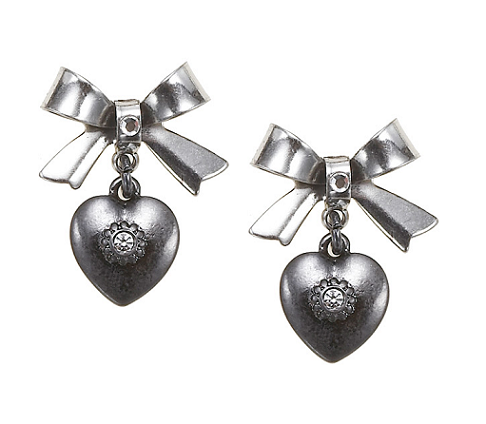 Pretty 'Charm Du Jour' earrings by The Bohm. A bow with dangly heart charm. Studded with Swarovski crystals in clear. Bows measure 2cm/20mm widest point. Total length 2.5cm/25mm. Shades of Hematite plate (light and dark silver/grey). Post with backing. Pretty 'Charm Du Jour' earrings by The Bohm. A bow with dangly heart charm. Studded with Swarovski crystals in clear. Bows measure 2cm/20mm widest point. Total length 2.5cm/25mm. Shades of Gold & Silver plate. Post with backing. Pretty 'Charm Du Jour' earrings by The Bohm. 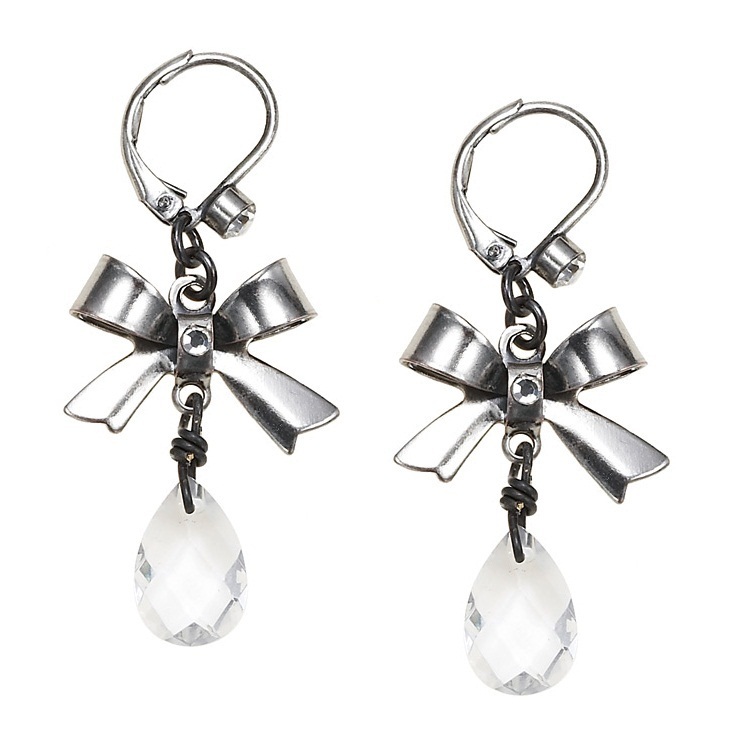 A dangly bow with faceted clear crystal drop. Bows 2cm/20mm widest point. Total length 5cm/5omm. Gold plate. French clip for pierced ears. 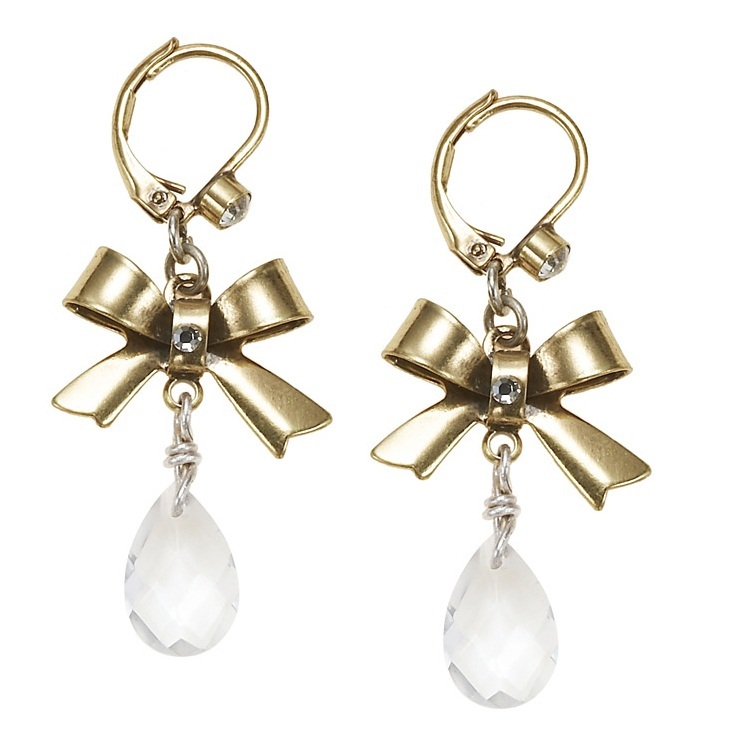 Pretty 'Charm Du Jour' earrings by The Bohm. A dangly bow with faceted clear crystal drop. Bows 2cm/20mm widest point. Total length 5cm/5omm. Hematite plate. French clip for pierced ears. 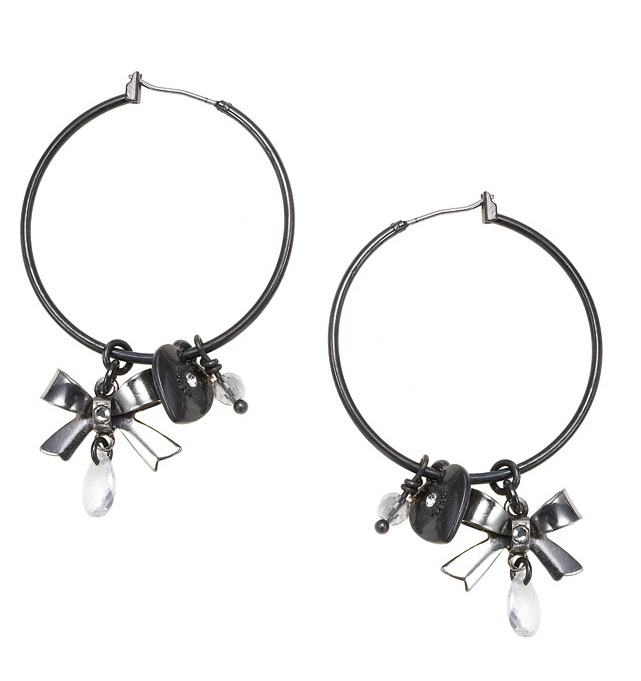 Pretty 'Charm Du Jour' hoop earrings by The Bohm. 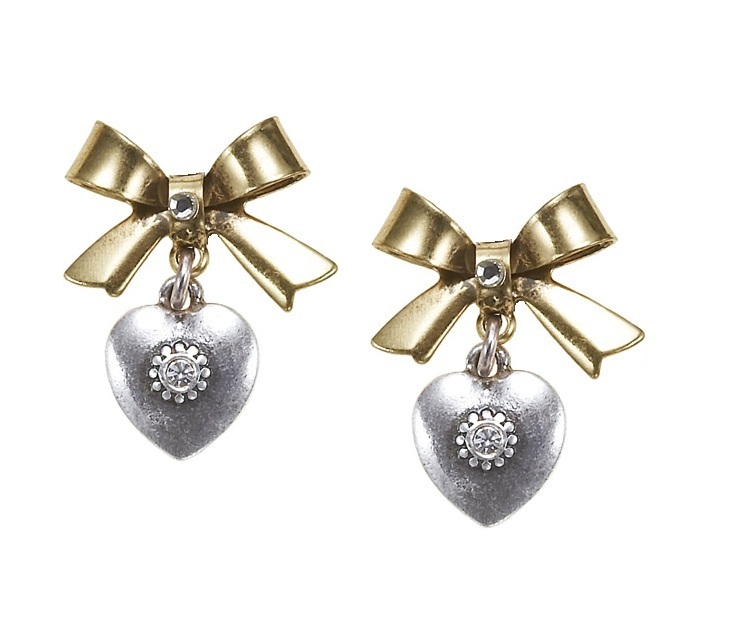 Bow and heart charms with crystal beads. Studded with Swarovski crystals in clear. Hoops measure 3.8cm38mm. Bows measure 1.7m/17mm widest point. Total length 6cm/60mm. Shades of Hematite plate (light and dark silver/grey). Pierced ears.